According to Burke's General Armory, the Maver arms are "Argent, three bars voided sable, over all a lion rampant gules. Crest - On a rock, and eagle standing proper." This translates as a red lion on top of six black bars (in three sets of two) all on a silver shield. The crest, the part that would go on top of the knight's helmet, is an eagle perched on a rock which should be illustrated using an eagles natural colors. My own representation of this is shown on the right. Who gets to use these arms? As far as I can tell, no one is currently allowed to use these arms. The Scottish heraldic laws are very strict and they treat arms as a material possession; that is, they can only be owned and used by one person at a time. This means that it would be illegal for anyone to use these arms without proof that they are the rightful heir to these arms. In the summer of 2006, I was able to inquire with the Lord Lyon King of Arms office in Edinburgh about the status of these arms. 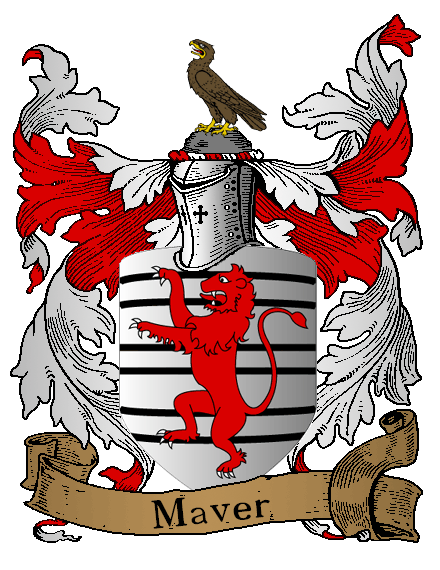 They informed me that they have no records relating to these arms or any others for the Maver surname. They suggested that I contact the College of Arms in London because at some times, armorial bearings were recorded there rather than in Scotland. I have not yet contacted the College of Arms and I am still in the process of figuring out who the rightful owner of these arms is. Some shops seem to be selling "the Maver Family Crest" as a shield with six rings on it as shown to the left. Unlike the arms listed in Burke's General Armory shown above, I have never found any reference to such a shield connected with the Maver surname in any book or historical record. My only guess is that these shops have invented this design. If you have any information about this design or any other Maver heraldry, please let me know.